Advice to Finance Minister Tito Mboweni - Hit the Ground Running! South Africa's once-lauded, lately beleaguered Finance Minister, Nhlanhla Nene, has had his resignation accepted by President Cyril Ramaphosa. 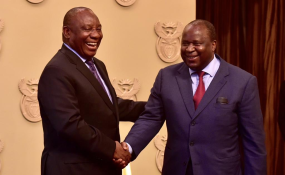 His successor, Tito Mboweni, becomes the country's sixth finance minister in four years. Nene was formerly regarded as "clean", having been fired by former President Zuma for refusing to fund his more ludicrous rent-seeking projects. He was replaced by Des van Rooyen for a weekend, and then left in the cold while Pravin Gordhan became Finance Minister (before in turn being fired by Zuma). Nene was rehabilitated by Ramaphosa - who defeated the entire Zuma strategy by winning the ANC (and then national) presidency. Nene's reinstatement as Minister of Finance was widely regarded as both politically astute and market-friendly. Almost by definition, anyone who is found to have past dealings with the Guptas - themselves now safely ensconced in mansions abroad - is unclean. And by definition that includes huge swathes of the political and business classes, whom the Guptas seem to have variously seduced, corrupted, cajoled, threatened or by-passed, depending on the strength of character at stake. The brilliance of their state capture project - laid out recently by the investigative journalists as well as various academics - is a roll-call of virtually every senior political figure in South Africa, alongside many business elites. Some stood up - but a great many folded, seduced by cash or a crass Sun City family wedding invitation or rotten contracts. Many are in parliament, some are in civil society, others in the private sector - including the consultancy firm KPMG, and UK-based now defunct PR company Bell Pottinger - and elsewhere. Not all are sitting on ANC benches. Perhaps that is why the President had no option but to remove Nene. Politically, the liability was too great as an election approaches - national elections are due next year - and none are so shrill as those with something to hide. Nene went to the Zondo Commission into state capture and 'fessed up. Yes, he had met the Guptas. No, he had not taken bribes (well, he would say that, right?). Yes, he had been put under immense pressure to sign off on the nuclear deal which would have opened South Africa' coffers to looters. Yes, he refused to sign, and was fired. But what did he get in return? The Economic Freedom Fighters (EFF), whose leadership has repeatedly been accused of corruption, leapt to the offence, claiming Nene was "corrupt as hell" and promising to release more compromising details - which are yet to appear. The opposition Democratic Alliance (DA), desperately seeking the front foot it has lost since Ramaphosa's ascendancy, demanded Nene's axing and wanted other possible conflicts of interest investigated. Empathy is the ability to understand or feel what another person is experiencing from within their frame of reference. In simple terms, to put yourself in their shoes. It is singularly lacking in politics - from Trump mocking abuse survivors to South Africa today. Shout down the other side, win by volume and crassness, see honesty as weakness, but above all win - nothing else seems to matter. Not one politician had the decency to say 'that was a decent thing to do.' The lack of empathy was deafening. A lack of empathy is part of narcissistic personality disorder - an inability or refusal to identify with the feelings of others. This is a rather neat description of politicians, confirmed repeatedly. If politicians see only personal advantage, especially from the 'weakness' of others - weakness defined here as honesty, seeking forgiveness, repentance - then the future is bleak. But to all those self-serving, smug TV chasing politicians and others, whose own meetings with the Guptas, or other corrupt activities, have yet to come to light, remember one aphorism: people who live in glass houses shouldn't throw stones.